Welcome back Maharanis! 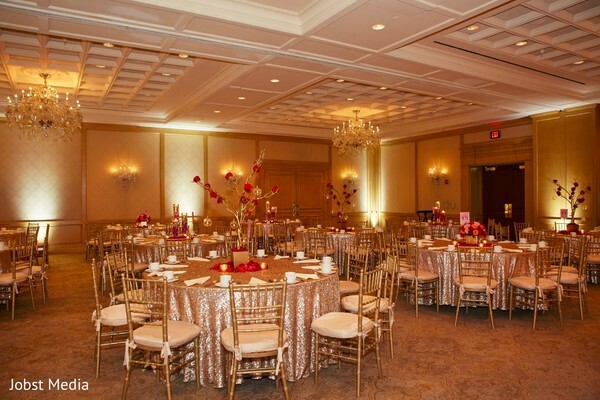 We’re excited to take you into Seema & Vikram’s stunning reception gala at The Townsend Hotel! 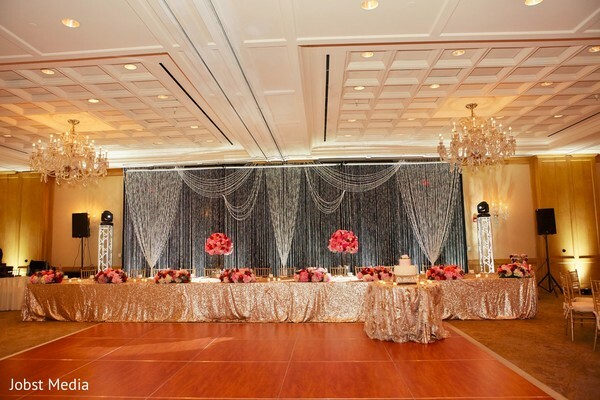 We have to say that their reception backdrop is one of our all time faves, with hundreds of crystal garlands draped intricately to resemble an enormous chandelier. What a magnificent centerpiece! We can only imagine how gorgeously it sparkled in person. 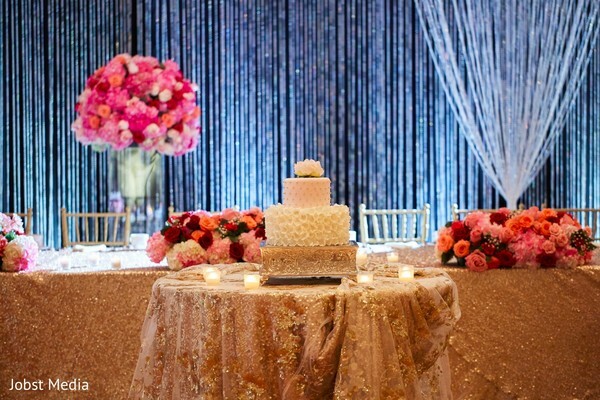 The glitter and glamour continued with sequined gold table linens, gold manzanita trees studded with red roses, and candles flickering throughout the room! 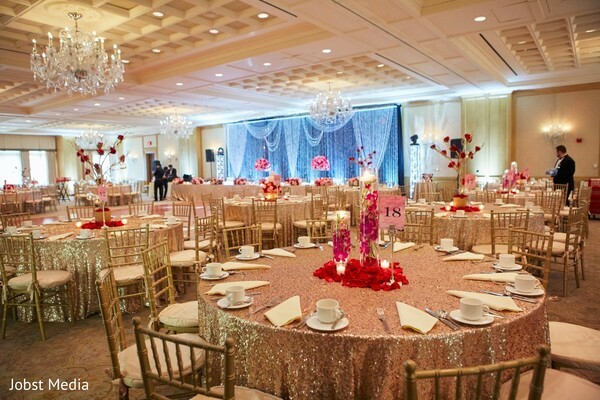 Hats off to Blissful Weddings & Events and Bellisario Florist & Colonial Events for transforming the ballroom into the most perfect, fairytale space for Seema and Vikram to celebrate their marriage! As soon as the beaming newlyweds made their triumphant entrance into the ballroom, their guests went wild! Everyone had the time of their lives during the reception program, listening to emotional speeches and rocking out to amazing dances. After feasting on flavorful dishes by Ashok Catering, DJ Ice & Fresh Productions took over the dance floor and beckoned every guest to let loose to celebrate the newly married lovebirds! The night ended in a whirlwind of glitter, strobe lights, and banging Bollywood tunes, and we can’t imagine a better celebration for this adorable couple. 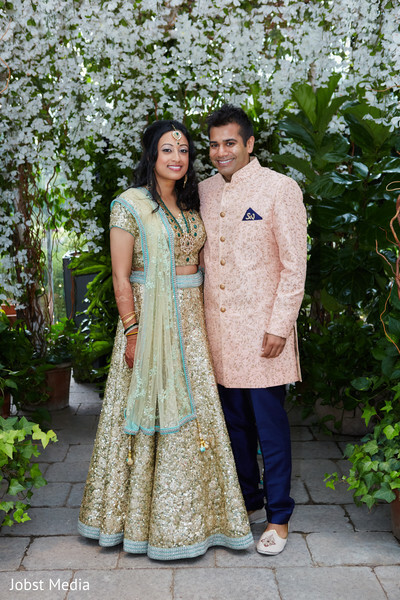 Maharanis, relive the fun and beauty of Seema & Vikram’s celebrations in the full gallery by the amazing Jobst Media. 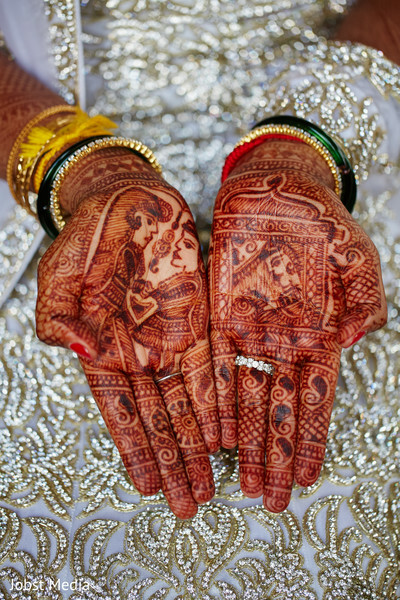 Maharanis, we’ll see you first thing tomorrow with another inspiring celebration!